Classic Industries offers a wide selection of Antenna Parts for your Chevrolet Bel Air. Classic Industries offers Chevrolet Bel Air Antenna Assembly, Chevrolet Bel Air Antenna Cables, Chevrolet Bel Air Antenna Masts, Chevrolet Bel Air Antenna Mounts. Unlike replacement style antennas, these reproduction assemblies are exactly like the originals. For the purist who demands perfection. We are pleased to offer these OE style antenna assemblies that include hardware. 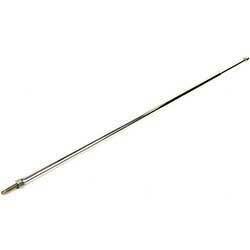 Replace your pitted or missing antenna base with this quality reproduction. Reproduction of the rear antenna base gasket for 1957 Chevrolet models. This metal nut is the correct size and type to mount an original or reproduction front antenna base for 1955-57 Chevrolet full size models. This reproduction of the electric antenna for 1957 Chevrolet models features an original style mast and correct hardware to fit as original. Repair your original rear antenna on your 1957 Chevrolet with this replacement base cap nut. Reproduction of the front antenna base gasket for 1955-57 Chevrolet models. Reproduction of the inner fender antenna gasket for 1955-57 Chevrolet models. This black plastic cap nut is the correct size and type for use with an original or reproduction front antenna base on 1955-57 Chevrolet full size models. Reproduction fender antenna delete plug for 1955-57 models. This plug was used on models that were not equipped with a fender mounted antenna. Replace your missing antenna mounting plate while you are replacing your base and gaskets to insure a stable mount.